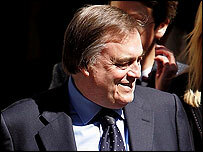 It is "outrageous" John Prescott will keep his salary and grace-and-favour homes despite losing much of his workload, a Labour MP has said. Geraldine Smith made the attack as Mr Prescott hung on as deputy prime minister but was stripped of his department in a Cabinet reshuffle. Fellow Labour backbencher Kate Hoey said people would wonder "what on earth he is going to get paid for". But No 10 says Mr Prescott has a heavy workload chairing Cabinet committees. Mr Prescott has faced damaging newspaper headlines during the past fortnight after admitting having an affair with one of his secretaries, Tracey Temple. Downing Street insisted he was not being demoted in the reshuffle. The bulk of Mr Prescott's local government and communities brief passes to ex-Education Secretary Ruth Kelly. The deputy prime minister will keep his grace-and-favour apartment at Admiralty House in London and his official country residence of Dorneywood in Buckinghamshire. And he is likely to continue to take charge of running the government when Mr Blair is out of the country. Morecambe Bay MP Ms Smith told BBC Radio 4's Today programme Mr Blair had sent the wrong signal by suggesting Mr Prescott was not fit to run his department but good enough to remain deputy prime minister. "It is outrageous that the deputy prime minister loses his department but keeps his position, his salary and the perks of the job," she said. "Most people were astonished by this reshuffle. "We have had excellent ministers like Jack Straw, and he is just side-lined, while people like John Prescott remain in their post without the responsibilities of office." The Conservatives accused Mr Prescott of being a waste of public money. Shadow chancellor George Osborne said: "John Prescott loses his department but keeps the trappings of office - including the car, the salary, and the two grace-and-favour homes. "Add it all up, and the taxpayer is going to be paying more than a quarter of a million pounds a year. If you're looking for ways to cut waste in government, you can start with John Prescott." Shadow home secretary David Davis dubbed the deputy prime minister "Prescott-lite". Mr Blair would have found it difficult to sack Mr Prescott without triggering an election to replace him as Labour's deputy leader. But new Labour Chairwoman Hazel Blears said Mr Prescott had been planning for some time to give up his departmental responsibilities to concentrate on other issues. "The job that John Prescott will be doing, and actually has been doing for a long time now, will be chairing some pretty high-level committees designed to try to make sure that policy right across government is focused on the things that matter to the public," she said. "He's got a lot of experience of doing that. He's also going to be following up some of the Kyoto issues around climate change." Former Conservative Deputy Prime Minister Michael Heseltine said Mr Blair had obviously wanted to make major Cabinet changes but been unable to sack anybody apart from Home Secretary Charles Clarke. Lord Heseltine said John Major had never told him he had "screwed things up" but could keep his title and money. He said Mr Prescott was now a "figure of fun". "That is humiliating, that is the most devastating and damaging thing that can happen," he said.